Tune in to Afternoon New Music today at 5 pm for an exclusive interview with violist Hannah Levinson of violin/viola duo andPlay. andPlay will be performing at Roulette on Tuesday, March 22nd at 8:00 pm to kick off the String Orchestra of Brooklyn's String Theories festival. andPlay will be performing works by Robert Honstein, Nicholas DeMaison, Fjola Evans, Peter Kramer, and Kristopher Svensson. andPlay is committed to expanding the existing violin/viola duo repertoire through performing rarely heard works and commissioning emerging composers. 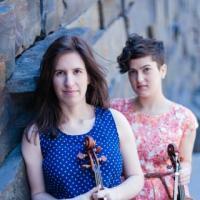 This New York City based duo of Maya Bennardo, violin, and Hannah Levinson, viola, first played to an eager crowd on Fire Island in the summer of 2012, and has since performed at venues such as Roulette, The Stone, Firehouse Space and The Tank. andPlay has also appeared on the PLG Arts, East Bank New Music, Contagious Sounds, Composer’s Voice, Times Two and the Concerts on the Slope series. The success of their first commissioned piece, “Pulling Anchor” by Matt Frey, led them to pursue similar opportunities with other composers, premiering twelve new pieces since their founding, including works by David Bird, Robert Honstein, and Ian Ng. Continuing with this tradition, andPlay’s collaborations this season, include composers Paul Kerekes, Hunter Long, Ivonne Paredes, Brian Petuch, and Kristofer Svensson.